The microKORG-S analog modeling synthesizer was an instant success when it was released in 2002. Since then, it has found its way into the hands of musicians all over the world. There is a line between fixing what isn’t broken and improving on a great design, and the engineers at Korg hold the MicroKORG in such reverence that its update and rejuvenation was a high-priority project. The chief goal was to ensure that the MicroKORG-S would remain one of the world’s most beloved synthesizers for years to come. The new microKORG-S features a built-in 2+1 speaker system with power that belies its size. Its chassis displays an elegant white motif, and the instrument itself features new presets that represent the sounds of a new generation. Inside the compact chassis of the microKORG-S is a sound system consisting of stereo speakers with clear imaging along with a woofer that emanates a startling amount of low frequency. One of the universal attractions of analog synthesis is a thundering bass, so Korg had to make sure a solid bass speaker was included in the design. The chassis uses a new box structure, and the combination of box volume and a bass reflex port deliver a rich sense of volume, low end and physical space that exceeds the expectations of the speakers. The built-in speakers allow a full-fledged performance experience in an environment where there is no PA. It can run on batteries so you don’t even need a power supply. The memory capacity has been increased from the original microKORG-S. Mainly centered on simple and present sounds that shine on stage, Korg has added 64 preset programs that meet the needs of the contemporary musician, including clearly defined and punchy leads, electric pianos that sound great in an ensemble and powerful, solid basses. In addition, we've also newly provided 64 additional slots for user programs, so you can save your own original sounds without overwriting the presets. This encourages a sound design process that's ideal for this instrument: select a sound that you like, and edit it. 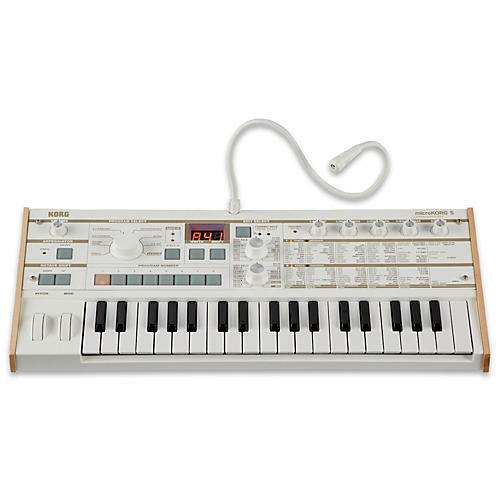 This instrument carries on all of the original microKORG-S's functionality, including the ease of selecting a program of a desired musical genre and then editing the selected sound, a vocoder with an included miniature microphone, and battery operation that allows you to perform anywhere. As a beginner’s first synthesizer that's easy to use, as a supplementary live synth for the stage, or as a sound module for production, the microKORG-S will continue to play a role in every music scene around for many years to come. 20.63" x 9.13" x 2.76"